PEN American Center, the largest branch of the world’s leading literary and human rights organization, announced this week the winners and runners-up of the 2017 PEN Literary Awards, the most comprehensive literary awards program in the country. Among the awards is the PEN/E.O. Wilson Literary Science Writing Award, which celebrates writing that exemplifies literary excellence on the subject of physical and biological sciences. 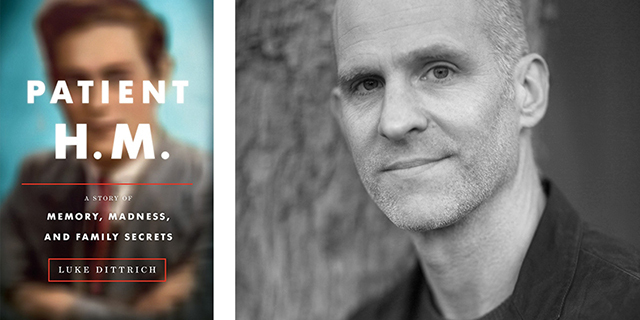 The winner receives a cash award of $10,000 and is honored at the PEN Literary Awards. The story of how Henry Molaison, an ordinary New England boy, became Patient H.M., arguably the single most important research subject in neuroscience, forms the backbone of this eloquent, deeply humane book. Luke Dittrich spares no one, least of all his own grandfather, as he explores the sometimes-disturbing ways science and medicine advance. In 1953, an operation performed by the author’s grandfather, William Beecher Scoville, stripped Henry of his memory — making him, for the remaining 55 years of his life, a tragic figure but a perfect subject for scientists interested in memory and cognition. “We found ourselves beginning to regard him the way you would regard a pet,” one of these scientists said. 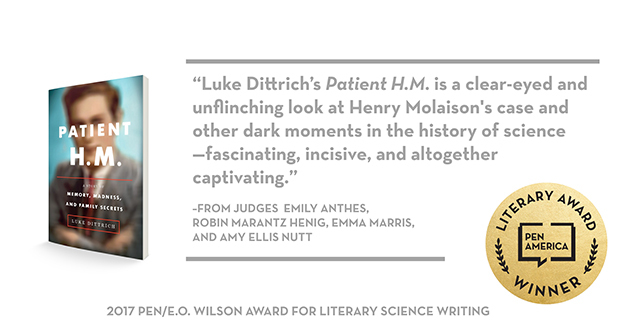 ‘He lost his humanness.’ Patient H.M. is a clear-eyed and unflinching look at Henry’s case and other dark moments in the history of science—fascinating, incisive, and altogether captivating. Emily Anthes is a science journalist and author. Her most recent book, Frankenstein’s Cat: Cuddling up to Biotech’s Brave New Beasts, won the AAAS/Subaru SB&F Prize for Excellence in Science Books and was longlisted for the 2014 PEN/E.O Wilson Literary Science Writing Award. Her writing has also appeared in the New York Times, Wired, Nature, Slate, and elsewhere. She is working on a new book about how indoor spaces shape our health, behavior, and well-being. Amy Ellis Nutt is a science writer on the national team of The Washington Post and the author of three books, including two New York Times’ bestsellers, Becoming Nicole: The Transformation of an American Family and The Teenage Brain with Frances Jensen. She was awarded the Pulitzer Prize in Feature Writing in 2011. Nutt has taught at Columbia and Princeton Universities and was a Nieman Fellow in Journalism at Harvard in 2005-2006. Robin Marantz Henig is a contributing writer for The New York Times Magazine who has written nine books, including Pandora’s Baby: How the First Test Tube Babies Sparked the Reproductive Revolution and The Monk in the Garden: The Lost and Found Genius of Gregor Mendel. She received a Guggenheim Foundation fellowship in 2010, and since 2013 has been an adjunct professor in the science journalism program at New York University. Emma Marris has written for many magazines and newspapers, including National Geographic, Discover, the New York Times, Nature, and Slate. In 2011, she published her first book, Rambunctious Garden: Saving Nature in a Post-Wild World. In 2016, she gave at TED talk about seeing the hidden nature that surrounds us and won a National Association of Science Writer’s “Science in Society” award for a commentary in Orion about our responsibility to save species—even at the cost of wildness. She grew up in Seattle, Washington, and lives with her husband and two children in Klamath Falls, Oregon. Past winners: Siddhartha Mukherjee, James Gleick, Leonard Mlodinow, Carl Hart, Joshua Horwitz, and Lauren Redniss.